Learning about the history of Irish whiskey would be so much easier if we Waffle boys were able to actually be there to witness the highs and lows (and do a few tastings)! Luckily, through the medium of cartoon, we are able to travel back in time and discover the secrets of this triple distilled tipple for ourselves. We begin our journey in the middle ages where Irish monks are distilling alcohol to create Uisce Beatha: the water of life! There is even a suggestion that it was the Irish who introduced whisky to Scotland, though this is, of course, disputed. What is not disputed is that in the early 19th century, Irish whiskey was the most popular whiskey in the world! Led by establishments such as John Jameson & Son Distillery, the style known as ‘Irish pot still whiskey’ was sought after worldwide! In fact, Irish whiskey consisted of 60% of worldwide sales. It was all going swimmingly until someone decided what Ireland really needed was a temperance movement. Irish whiskey had survived a lot. But the worst was yet to come. What could possibly be worse than the Irish deciding to ban alcohol? Losing America’s market share was a blow, but at least the Irish could count on sales in the British Empire, right? By the 1960s, the Irish whiskey industry was nearly kaput. The remaining distillers got together to discuss a radical plan to help them survive. Irish whiskey clung on, though there were still very few distilleries operating. By the early 21st century only three were alive: Bushmills, Cooley and Midleton (Irish Distillers). Between them they made every single Irish brand on the market. The hard work paid off. The recent explosion of interest in whiskies from around the world has seen the number of Irish whiskey making establishments quadruple in the last ten years. Kilbeggan, Tullamore, Teeling, Dingle, West Cork , Glendalough, Walsh, Blackwater and more have recently opened their doors. We now enter what is being billed as a new ‘golden age’ of whiskey production in Ireland. There are many willing customers around the world, eager to discover what these new distilleries are all about. Things are certainly looking up. Irish whiskey is back from the brink. This is about as hipster as I get. Leaning up against a rough-sawn wooden bar in a small craft beer joint in Kyoto and sipping some NYC bourbon poured from a 375ml bottle with a label that looks type-written. In fact, as I type these words, a number of Japanese gents wearing round steel-rimmed glasses and with beanies perched on their heads have just walked in. I am probably not cool enough for this place. The bar is called Bungalow; the fact that it is separated from the busy street outside by only a clear plastic screen somehow makes it seem even more edgy. The vibe inside is very chill though, with friendly bar staff, a selection of Japanese craft beers and luscious funk tunes oozing from the speakers. It also has precisely one whiskey, the Kings County Bourbon Whiskey. Apparently the owner is friends with the importer of the Kings County and is a fan, hence its presence as the only whiskey in a craft beer bar. Kings County is apparently the oldest operating whiskey distillery in New York City… Est. 2010. It’s youth is due to the fact that it is the first whiskey maker in the Big Apple since prohibition ended. Based in the old Brooklyn Navy Yards, they craft spirit in their Scottish-made still using corn and barley grown on-site. It’s very much part of the dynamic and sustainable ethos that exists in Brooklyn today. The spirit itself is a very dark copper colour and is bottled at a pleasing 45%. Being a bourbon it has that heavy, corn-driven punch, but in this case it’s pleasantly not overpowering. There’s a sweet, savoury sharpness that evokes some of the flavours that I have come across in Japan. Soy sauce, mirin, that sticky stuff I had on that grilled meat in that yakitori joint, a hint of salt and tuna sashimi. Of course, these flavours are super-subjective seeing as this is a through-and-through American spirit. I’ve just been exposed to a lot of eastern flavours this past week. The mouth-feel is solid. The usual big, sweet corn flavours are there, but they are well controlled and even-tempered. It has a crispness and acidity that evokes a glass of Sav Blanc or Pinot Grigio, leaving a nice juicyness to linger on the palate. There’s a buttery, saltiness too, like that scallop I had in Kuramon Ichiba Market that was grilled over coals in its own shell. The Kings County is a damn fine whiskey, perhaps made even better by dint of my current geographical location. Kyoto is a beautiful city, Bungalow is just my kind of bar and the Kings County is an excellent finish to the day. If you’re going to drink a whiskey you’ve never heard of in a bar in Japan that you stumbled across by chance, consider making it a Kings County. Well we like it we like it we like it we like it we la la la like it. La la la like it. Here we go-oooh! We’re Waffling around the world! After the roaring success that was our tour of Scotland, we’ve decided to jump on a big old jet airliner and go global. Our next Waffle Night will occur on the 22nd of July and once again be held at Burnie’s best cafe and whisky tasting venue: The Chapel. We will be sampling whisky (and whiskey) from various exotic countries around the world… and America. So giddy up and giddy up and get away. We’re getting Waffly in the best kind of way. Here we go-oooh! We’re Waffling around the world! 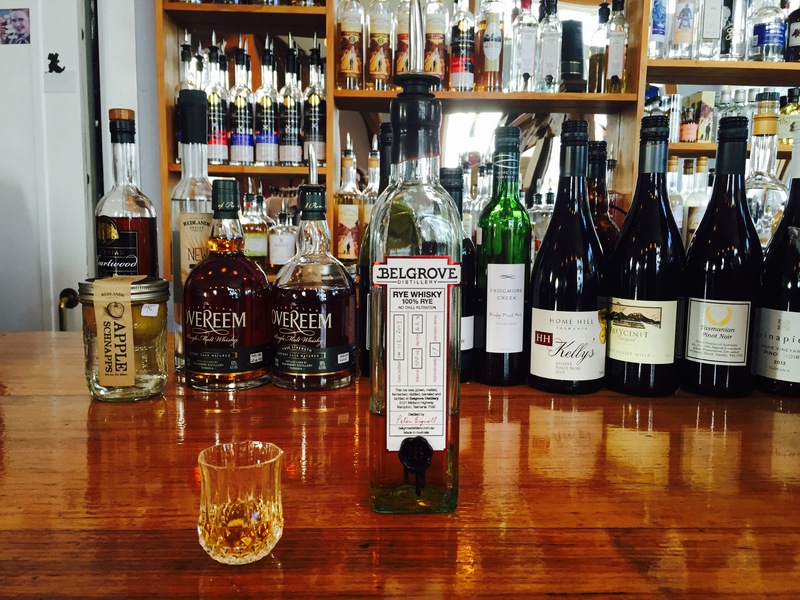 Independent bottling in Tasmania is a relatively rare thing. Sure, there’s the mighty Heartwood leading the way and a few others coming on board, but by and large, it’s an unexplored market. One person who realised this a long time ago is whisky fanatic and Whisky Waffle guest contributor, Alex ‘Moorsey’ Moores. Despite maintaining a fledgling full-time career in law, he has achieved what most whisky lovers can only dream about – he has created his own whisky: Dark Valley. Dark Valley was named after the area of Hobart in which Alex grew up, Glen Dhu. While the temptation was there to name his drams simply ‘Glen Dhu’, being a qualified solicitor he was aware of the legal dangers of such a Scottish sounding name. He instead opted to translate the Gaelic into English and name his bottles ‘Dark Valley’, setting the tone for the gothic labels and imagination-stirring individual release titles such as ‘Raven’s Roost’ and ‘Hunter’s Keep’. Importantly for Alex, he did not wish to tinker in any way with the whisky – he wanted to showcase it in as close to its natural form as possible. This meant no diluting, no blending, no finishing and no filtering. His aim was to create a whisky that was the next best thing to getting it straight from a barrel. While the first releases from Dark Valley feature whisky distilled at Lark Distillery, it is Alex’s hope that one day all Tasmanian distilleries will contribute spirit for his range. He already has Redlands on board and northern-Tassie’s new boys Adams are next on the list. For now though, there are three different bottlings in existence, all of which I was lucky enough to try at Dark Valley’s Hobart launch. The first I tried was the 60.3% sherry matured ‘Raven’s Rest’. My initial reaction was “Yes. Yes yes yes. Yes. Yes.” It was like cooking raspberry jam – so warm and fruity. Next up was the ‘Widow’s Watch’ – bourbon matured and 65.8%, it was full of vanilla and baked goods. I decided on cupcakes, with orange icing and poppy seeds. Finally was the port matured 62.7% ‘Hunter’s Keep’, and it was my favourite of the lot. 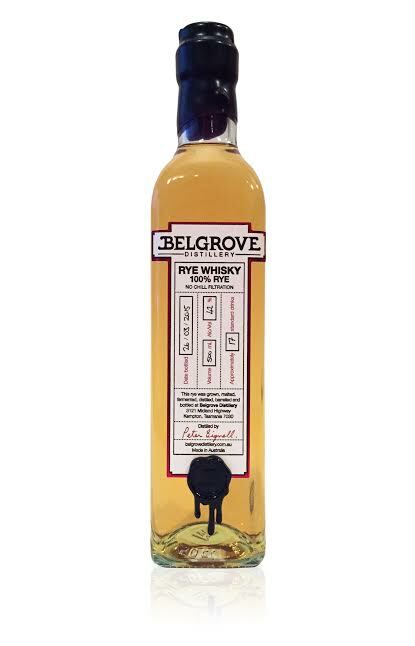 It combined the flavours of the other two beautifully while adding hints of cinnamon and nutmeg, creating an effect I described as ‘mulled whisky’. It was superb. The drawbacks of setting up a new whisky brand is, of course, the cost. Dark Valley will certainly not be going into mass-production any time soon. In fact, these releases came from tiny 20 litre casks, meaning just over 30 bottles of each were made. However, this doesn’t mean you’re unlikely ever to see sight nor sound or them. Alex’s very firm goal is to get Dark Valley into whisky bars – and not into the hands of collectors. He intends to get his product into various establishments in Melbourne and Tasmania, with a few in Hobart showing some interest after the successful launch. In the coming months, if you happen to be near a whisky bar in any of these locations, ask after Dark Valley, because once people discover how good it is it’s not going to last long. Finally, on a more personal note, I’d just like to offer my sincerest congratulations to Alex for achieving the spectacular feat of getting his whisky to bottling stage. Moorsey is a genuinely top bloke and I know he’ll be another wonderful torchbearer for Tasmanian whisky. This big hitting bourbon takes it’s name from one of Kentucky’s most beloved sons, Booker Noe, grandson of the great Jim Beam himself. As master distiller at Jim Beam for many years, and a child of one of America’s greatest whiskey dynasties, Booker had an innate knowledge of the spirit he crafted. As a testament to his skill he selected barrels of special character to create an expression bearing his name and personal taste. According to Booker’s note on the bottle label, his grandfather preferred his whiskey to be aged between 6-8yrs. My bottle, containing batch C04-A-28, hits that mark perfectly, being aged for 7yrs and 4months precisely. 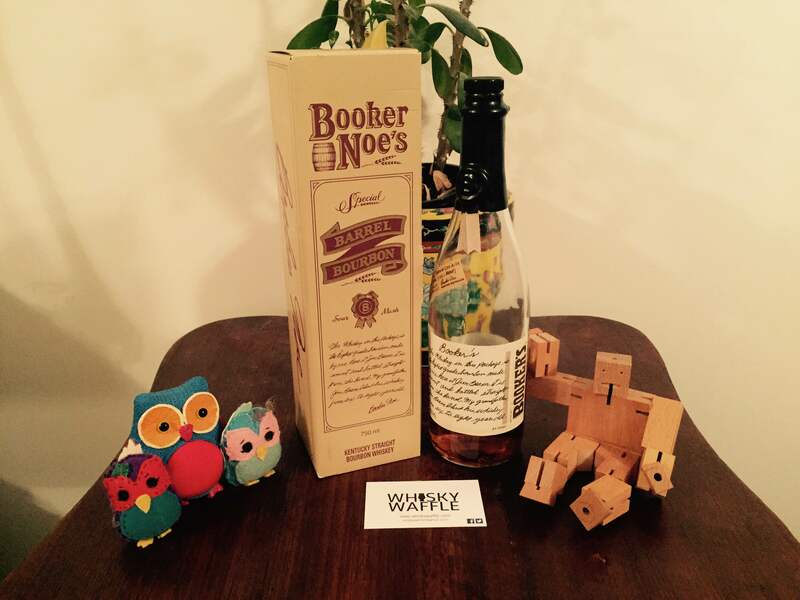 What really gives the Booker Noe its teeth is that fact that it’s bottled straight from the barrel. Therefore the bottle of dark, uncut Kentucky spirit sitting before me is a hefty 64.55% abv, or 129.1 proof in the American money. I make no joke about the potency of this stuff, as it’s responsible for some of the few alcohol induced blank spots in my memory. Just to hammer the point home, our women folk are generally pretty indulgent and tolerant of our whisk(e)y drinking proclivities. Yet when the Booker comes out, or even if there’s vague hints of it, stern looks and muttering along the lines of ‘Oh God, you’re not drinking that stuff again are you? Remember what happened last time?’ occurs. Suffice to say, m’colleague and I have not been found in the best shape afterwards. Yet, even after all that, there is something about the Booker Noe that keeps drawing us back. It’s the bold, gutsy, manly nature of it I think. Bourbon in the raw. The nose is solid, a big slab of dusty corn sweetness that drops down on you like a sack of, well, corn. Of course, because of the strength there’s an undertone of nail polish remover, but it blends well with the sweetness, only frying the occasional unsuspecting nose hair. The taste is bold, taking a big, sharp, sweet, fruity swipe at your palate. The spirit fills the mouth, making your cheeks tingle and the blood rise. The finish is oaky and sour, and keeps you pinned down until it finishes punching you in the face. Its pretty common for distillers to lay down Scotch for long periods of time, with age statements in the range of 18-25 years in relative abundance. Bourbons on the other hand are a whole different kettle of fish. Warmer storage temperatures and the use of virgin oak casks means that bourbon reaches maturity and develops character far more quickly than its Scottish counterparts. Therefore, if you come across a bourbon that says it’s 20 years old, you know you’re looking at something pretty special. 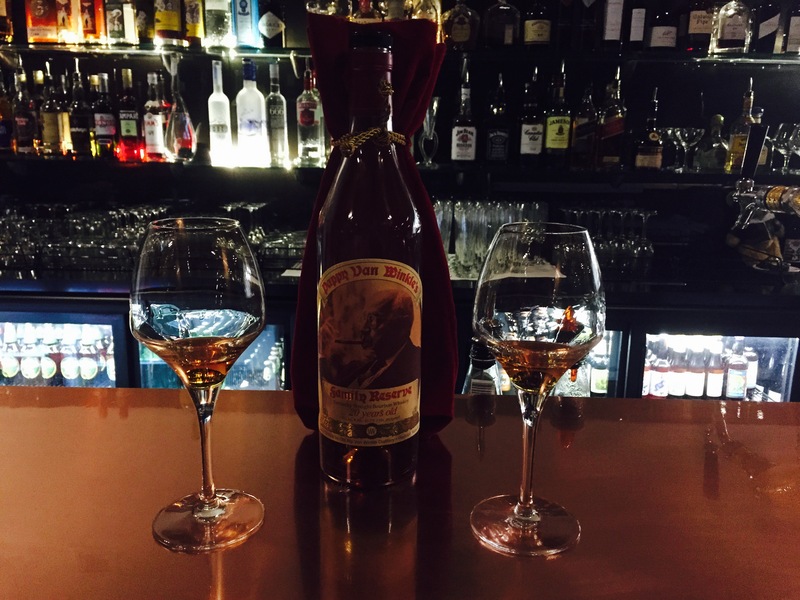 The Pappy Van Winkle Family Reserve 20 Year Old is an experience unto itself, a man amongst the boys. Now into its 4th generation, the dynasty began in the 1870s when Julian P ‘Pappy’ Van Winkle entered into the proud Kentuckian tradition of bourbon making. These days the Van Winkles make their spirit at the Buffalo Trace distillery, but they have not lost their dedication to crafting spirit of an exceptionally high standard. Apart from the age, what makes Van Winkle bourbon special is that they use corn, barley and wheat instead of the more usual corn, barley and rye in their mash bill. They claim that the use of wheat creates a much softer, smoother spirit and helps with the aging process. Compared to your standard ‘ol bourbon, the PvW Family Reserve 20yo is a far more delicate creature. You can still tell it’s bourbon when you take a sniff, but it doesn’t wave the fact in your face. Instead it gently strokes your nostrils with vanilla, ginger and Grand Marnier. As you would expect for a spirit this age, it is superbly smooth with no alcoholic kick at all, which is interesting as it is still bottled at 45.2%. It feels very light and silky in the mouth, and if you draw some air through it goes all tingly, sending shivers down your tongue. Floral notes, particularly rose, mingle with sweet white grapes, maraschino cherries and alcohol-soaked cake. The finish is quite short and as smooth as a baby’s proverbial. The PvW Family Reserve is the thinking man’s bourbon; gulping it down is simply not an option as it needs some time to respond in the mouth. At first glance it seems deceptively simple, however with some gentle probing it reveals more and more character. There are definitely interesting things going on, but you have to chase them down, work for the full flavour. The dedicated and thoughtful approach is worth it in the end though, as the reward is a spirit of epically elegant proportions. And so after seven days, the Whisky Waffle boys finally stumbled out of the endless Kentucky cornfields. Many interesting facts had gone in one ear and out the other (must have been something to do with the corn), and much sippin’ of spirits had been accomplished. We scaled the (Brokeback) Mountain of American whiskies, and came out safely on the other side. So what did we learn? 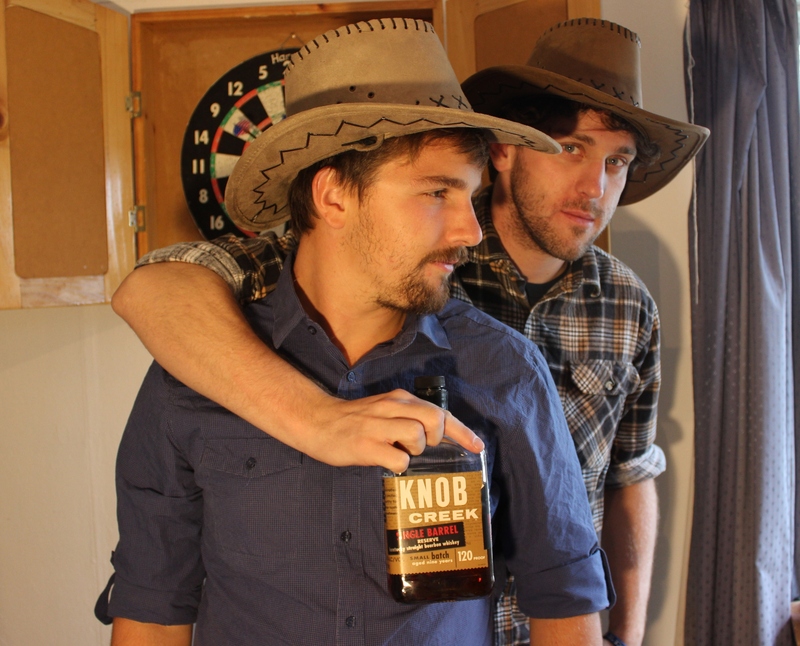 The story of forbidden love between two men… and bourbon. When it comes down to it, bourbon still tastes a lot like bourbon.